More progress on the kitchen today. 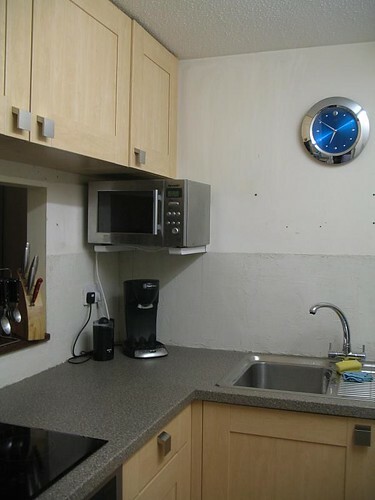 The fitter came back to hang the microwave and replace a few of the cabinet doors which had been scratched in transit. Admire all that counter space! It's a bit strange to have the microwave placed perpendicular to the cabinets, but we thought it would be easier to get food in/out, given that the door opens on the wrong side. But it wasn't all great news... The floor is, to put it as politely as possible, a work in progress. When we first approached JL Fitted Kitchens, we were told there were two things they did not do: tiling and floors. For flooring they suggested their JL Flooring Department, conveniently located upstairs from the Fitted Kitchens Department in their Oxford Street store. We went upstairs after our initial chat with the kitchen dept, but did not get anyone's attention. A few weeks later, the kitchen planner visited to measure for cabinets and work with us on the overall design. He told us that it would be easy for his dept to pull up the existing floor, and to coordinate with JL Flooring to get the new floor installed as soon after the kitchen install as possible. We went back to JL Flooring to pick out our vinyl. Again we failed to get anyone's attention. Two weeks before the kitchen install, aware that we were cutting it close, I went back to JL Flooring again. This time, I found someone and asked for an appointment to have the floor measured. I had planned to take the day off work on 13 Oct, but they did not have any open appointments until 15 Oct. I was assured that we would get 'first call', meaning that they would come between 8-9 AM. I also got a verbal quote of around £230-260. When I got home, I noticed that the confirmation sheet they had given me said "13 Oct". Hmmm. Well, the 13th came and went and the measurer never showed up. On the 15th, we waited until 9 AM. No show. Around 11 AM that day, S got a call: "I'm outside your flat, but you're not here..." Er, no. S got them to reschedule the measuring for 30 Oct instead, but at this point we were getting a bit annoyed. The kitchen was installed during the week of the 20th. Meanwhile, I decided to shop around for other floor options, and discovered that Marc Edward Carpeting was just up the road from our flat. I popped over on my lunch break and had a good chat with one of the salesmen there. He gave me a verbal quote of around £160, so already I liked his approach more. I made an appointment for him to come measure the floor on the 27th. 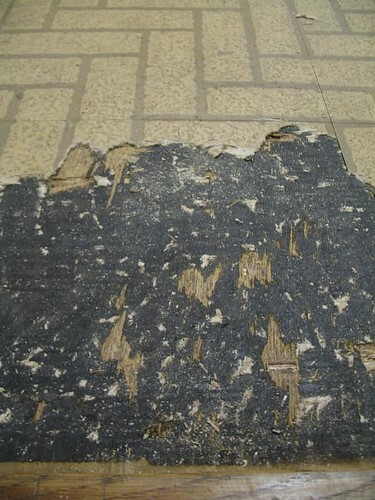 We relished the thought that we could have a new floor put in before JL ever made it over just to measure. Ha. Unfortunately, the MEC quote was substantially higher than the verbal quote, so we decided to give JL another chance. They came, they measured, we waited. However, clever S noticed that part of the MEC quote was taking up the old floor, which we had already paid for as part of our agreement with JL Fitted Kitchens. Ha! This brings us to today. The fitter was not very happy about having to take up the floor. In all fairness, he never should have been asked to do it, but the planner had made a foolish promise... I heard some banging and chiseling and then, oh no. The floor was not coming up easily at all. We decided to abandon the project before it got much worse. As for timing, the JL Flooring quote came in today's post and it's also more than the verbal quote. So we now have a decision: go with JL or MEC? It's a cliffhanger, for sure. Oh - and we still need to do the tiling. Another choice: DIY or hire someone?? ?